I have to say, your Import PST to Office 365 software saved the day. I started on a Friday night and needed to have all my email imported and tested for Monday morning. When I found the regular exports and imports from outlook weren't doing the trick, I started to panic but then I found your program. I found it very easy to use... Source, Destination, GO! I liked that it showed the status of what it was working on. 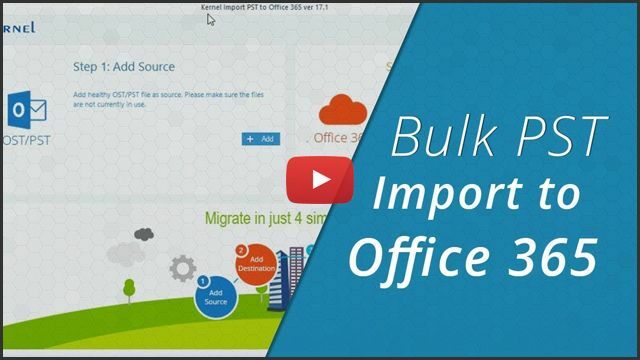 The tool has a simple user interface that facilitates import in just four simple steps – Add PST file, Add Office 365 account, map PST files to mailboxes, and import PST files. No need of any technical expertise to do this. Moreover, PST files can be imported to Exchange or Office 365 even if you don’t have Outlook installed on your system. The software can import PST to Office 365 user mailboxes and user groups seamlessly. It allows users to import single or multiple PST files to single user account using login credentials. One can migrate bulk PST files to multiple mailboxes in single attempt. For doing this, you need Global administrator credentials to fetch user mailboxes of admin account. 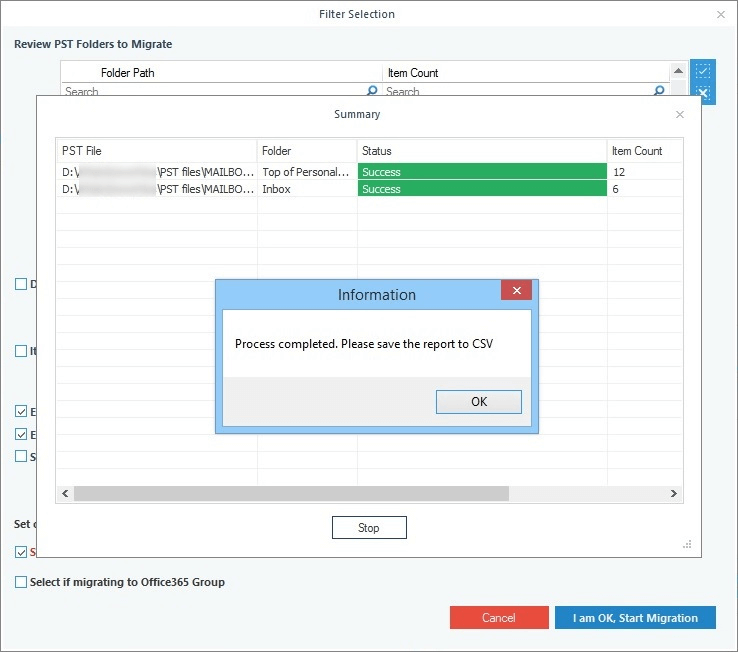 The PST to Office 365 migration tool migrates PST files to multiple mailboxes in a single attempt. For this, you need to use an account Global administrator credentials. It also, allows to map the PST files to different mailboxes – manually or using CSV. Office 365 administrators can automate the mapping process with the help of a CSV file. For this, they need to download a blank CSV file, input the required details, and then upload it. The use of CSV file reduces the time and effort required for the manual selection of mailboxes. 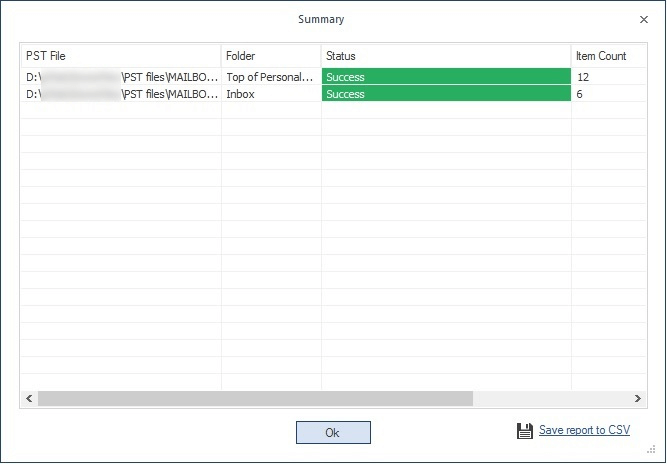 OST file is an Offline copy of Outlook mailbox available on the Exchange Server. The Import PST tool is programmed to proficiently import OST files to both On-Premise and Hosted Exchange Server safely using the credentials. The Import PST to Office 365 tool supports migration of PST files to Exchange Server. It supports both on-premise Exchange and hosted Exchange and can import PST files to any version of Exchange Server. The software imports single or multiple PST files to single or multiple mailboxes in one go. You do not require administrative privileges for migrating to single user account whereas for migrating to multiple user accounts you require Global administrative account credentials only. 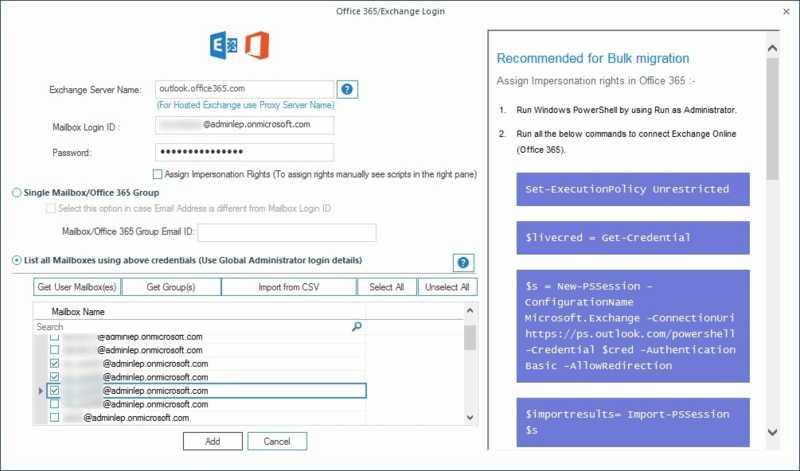 The tool allows users and administrators to import PST files to Archive Mailboxes of Office 365 account. 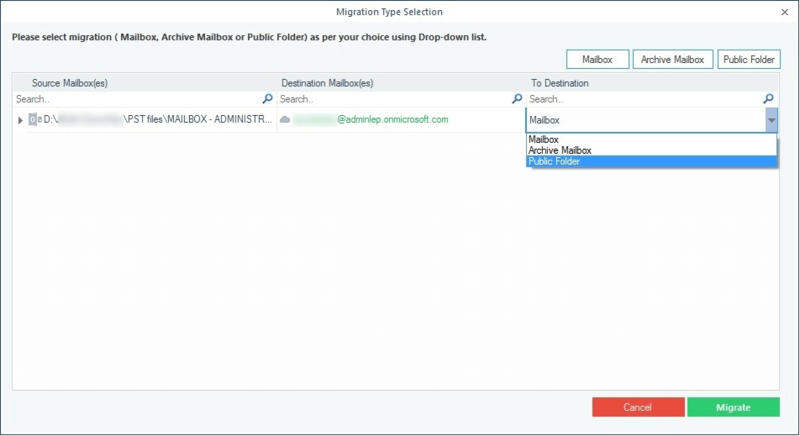 You can select destination as Archive Mailbox under Migration Type Selection Window instead of Mailbox. It will create a new folder and import all data inside this folder. The software interface facilitates import of Outlook PST files to Public Folder of Office 365 account. Users can choose Public Folder as destination for Office 365 or Exchange Server. In addition, users can also import PST files to Shared mailboxes. The tool works accurately to import emails of PST file with the corresponding attachment. It supports complete migration of Outlook mailbox to Office 365 account such as emails, contacts, calendars, tasks, etc. 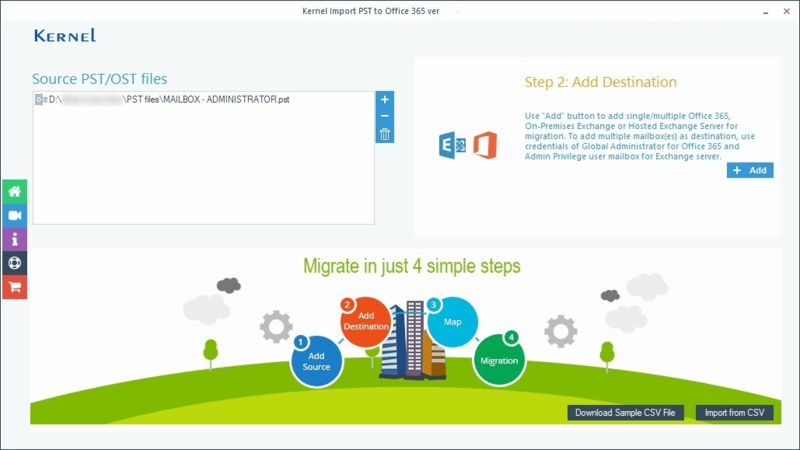 You can use the tool to perform PST to Office 365 Migration. You do not need to wait for a single import job to finish to start the next one as the software can run multiple instances concurrently. All the instances run separately to complete the task faster. If you have already imported a PST file, and now wants to import the same PST file with additional data, then you can choose to skip the previously imported items of the PST file. So, there won’t duplicate items in the destination. 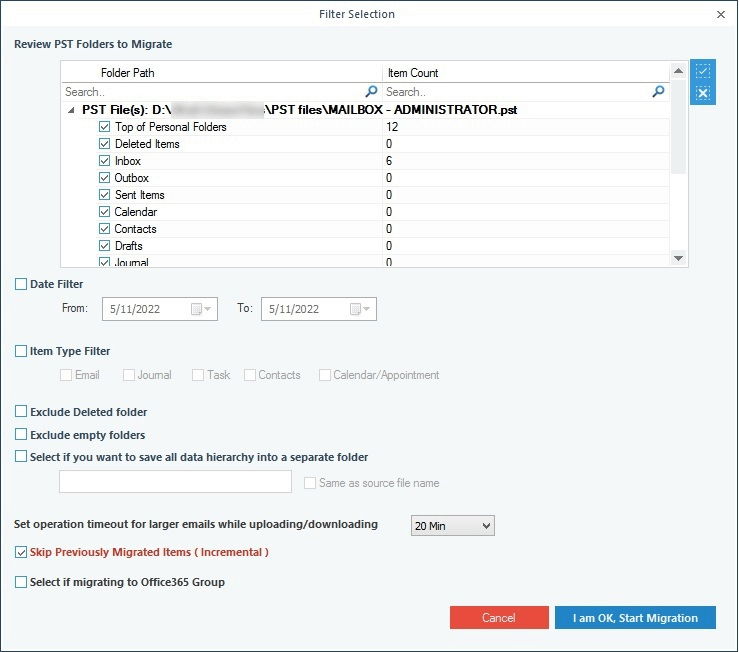 The tool helps to filter the PST data before importing to the Office 365 mailboxes. With its filtering and selection options, users can select a particular date range/item type, and remove or exclude deleted items & empty folders. After the PST import, you can save the report in CSV format to analyze the whole process. The report specifies the number of folders migrated successfully, their type, and errors (if any). How to Import PST to Office 365/Exchange? SelectSelect the PST file in the Source section and add Exchange/Office 365 in the Destination section. MapFinally, select the mailbox/archive mailbox/public folder to which data is to be imported. ImportFilter the items of the selected PST file by different criteria. 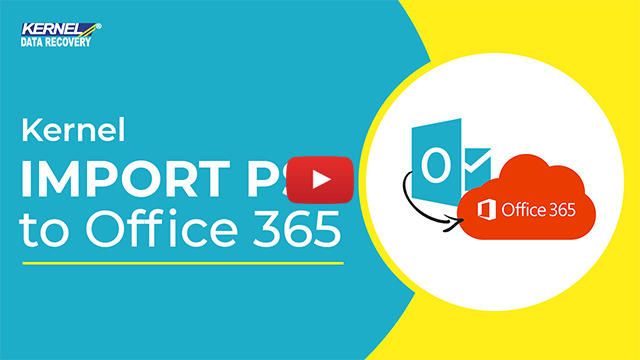 How to import Outlook PST file to Office 365 online with the help of software? 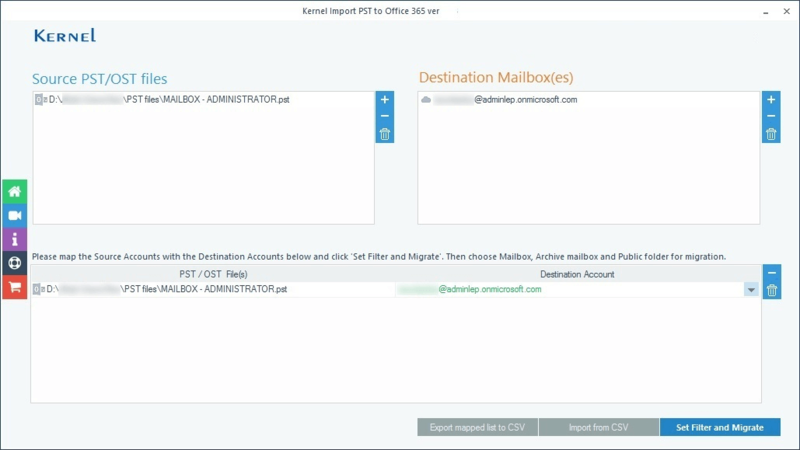 Run Kernel Import PST to Office 365 tool. Click Add button in Source Pane and choose OST/PST file as Source. Click Add button in Destination pane and type Office 365 credentials. Choose Single/Archive mailbox and Map the Source to Destination. Select amongst mailbox, archive mailbox, and public folders. Apply a filter for migrating selective PST data items. Click I am OK, Start Migration, save the log report once it is completed. Yes, surely you can migrate the contact information selectively. In the Filter Selection window, there is a feature named Item Type filter. Just check the Contacts option and uncheck all the others. Can I import multiple PSTS to multiple office365 accounts? Which license of the software should I buy? Yes, the software lets you import multiple PST files to different and multiple Office 365 mailbox accounts. To perform the task, you can simply select multiple PST files as Source and in destination you can add multiple Office 365 accounts using user or administrator accounts for importing to primary mailboxes, archive mailboxes and public folder. Also, you can add user accounts of different Office 365 domains at the same time. We have 3 different Licenses. If you are buying the software for personal use then Home User License is suitable for you. The software can be installed on up to 2 computers to import your personal Outlook PST files. 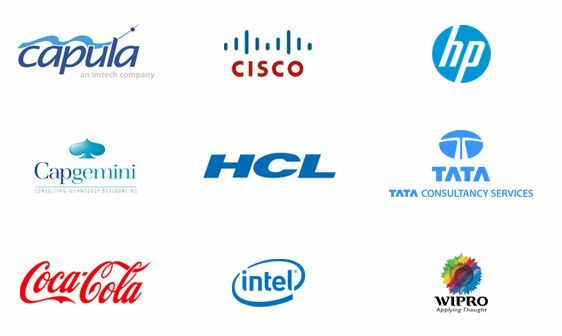 If you are buying the software for your organization then Corporate License is the best choice. The software can be installed on multiple computers within an organization at a single location. If you are buying the software for providing services to users then Technician License is highly suggested. The software can be installed on any number of computers at different locations. There are some empty folders in my Outlook account. Will they also be there in Office 365? 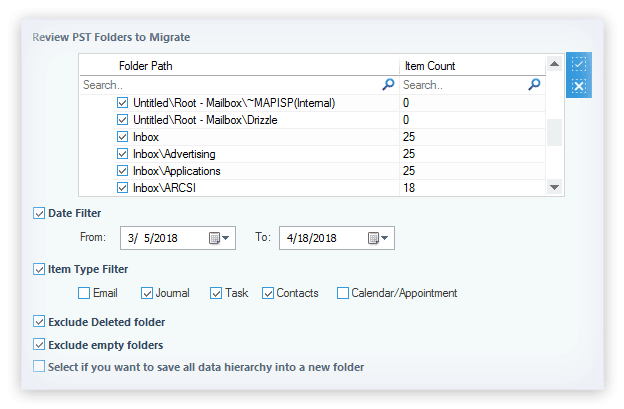 If you choose to exclude the empty folders from migration. Just check the Exclude Empty folders option in Filter Selection window. I was trying to add Exchange mailbox as a destination, but the tool was showing an error HTTP Status 401: Unauthorized. How can I resolve it? You may get such an error when the Username Principal Name (UPN) is different from the email address. To resolve the error, you need to enter both the UPN and the email address. The software Works perfectly fine on Windows 10. What is better than availing the benefits of total software with the trial version. Their trial version worked exactly as the paid one. Heya! The excellent teamwork and speedy service is what hooked me up with this company and this software! Keep up the good work guys! Import PST file to Single\Archive Office 365 Mailbox. Map the source PST file to target 365 mailboxes. 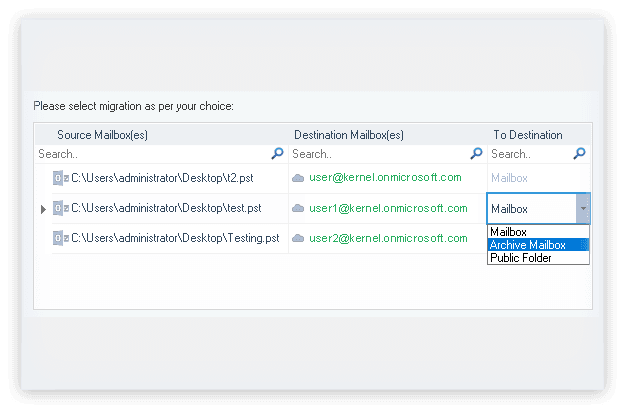 Select among Mailbox, Archive mailbox, and Public folder for single PST file. Apply appropriate filter for PST import to Office 365. Accurate PST import to Office 365. PST to Office 365 import report. Office 365 mailboxes to which multiple PST files are to be imported. 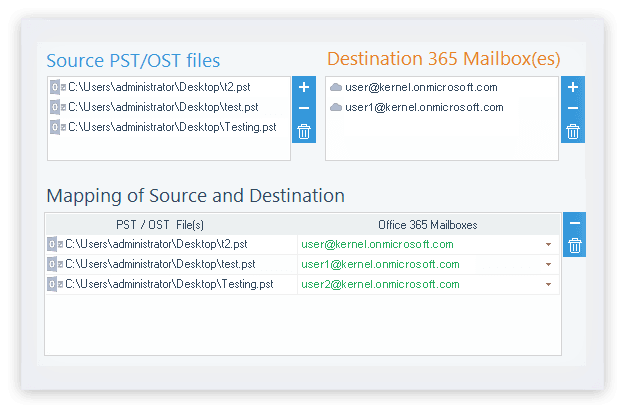 Map the source PST file to appropriate Office 365 mailboxes. Easily export Exchange/Office 365 mailboxes to PST file without Outlook. 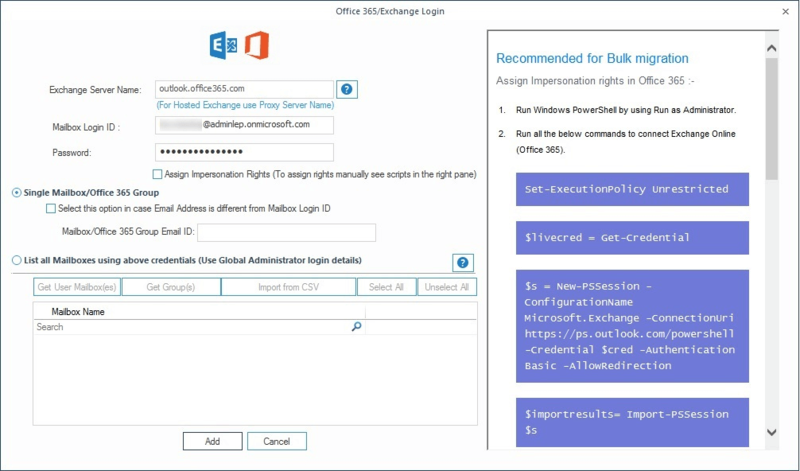 Extensive tool to backup and restore Office 365/Exchange mailboxes to PST. Export Office 365/Exchange mailboxes to Amazon WorkMail quickly.